Fantastic for the kids this Summer! Quick and easy to set up! 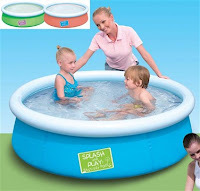 Made out of heavy duty PVC with polyester 3-ply side walls, and the liner is supported by an inflatable top ring. Comes complete with repair patch. Size 154 x 38cm (60½ x 15"). Only £19.99 Order yours today!